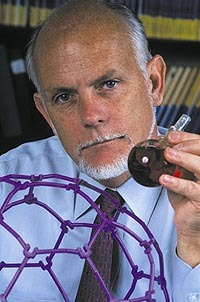 American chemist and physicist Richard E. Smalley was an expert in cluster chemistry and cold ion beam technology, conducted extensive research into nanotube single-crystal growth, and championed research into nanotechnology. He is best known for his 1985 discovery, with Robert F. Curl, Jr. and Sir Harold Kroto, of carbon-60 (C60), a previously unknown allotrope of carbon. C60 consists of sixty atoms structured in the shape of R. Buckminster Fuller's geodesic dome, and thus was named buckminsterfullerene. Smalley said that he was inspired to a life of science by the widely-publicized 4 October 1957 launch of the Soviet Union's Sputnik spacecraft, and by his aunt, Sara Jane Rhoads, a chemistry professor at the University of Wyoming and one of the first American women to reach that position. Curl, Kroto, and Smalley shared the 1996 Nobel Prize for Chemistry.